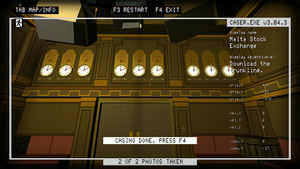 Quadrilateral Cowboy is a puzzle and hacking game developed by Blendo Games and released on 25 Jul 2016 using customized idTech 4 (Doom 3) engine. The sigil was added on release. 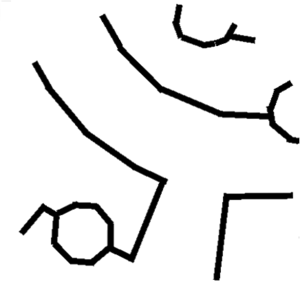 The sigil is a background texture on the Malta Stock Exchange level. It adorns the world clocks on the wall of the stock exchange room. One of the monitors on the "Malta Stock Exchange" level has an error message Guru Meditation 089F: MISSING CHUNKS. Within the game resources files, the code that renders text on this screen is in guis\stocks4.gui file. More sepcifically, the error message is inside the block titled DELETE_THIS_CHUNK. Above it is a block titled chunkContainer that already has some rectangles drawn on the screen (the DELETE_THIS_CHUNK part erases them). Then it's followed by a comment suggesting to add more chunks. Additional chunks segments can be found being commented in other gui files of this level (stocks.gui, stocks2.gui and stocks3.gui). Removing the DELETE_THIS_CHUNK section and placing the chunks from those other files into the chunkContainer makes the screen render the piece with rectangles. The game itself was released DRM-free and its source code was also released later, but it wouldn't have anything related to the ARG, since everything about the piece was done in the GUI scripts. This page was last edited on 20 August 2016, at 18:03.